Heard about, from a couple of sources, Eclipse Safari by Simulation Curriculum. The same people who make SkySafari of course. Downloaded the free app to my Android tablet to try it out. There's an event countdown on the home page. It has an interactive map that uses your devices location which in turn calculates the contact times. I didn't see a way to override the location. 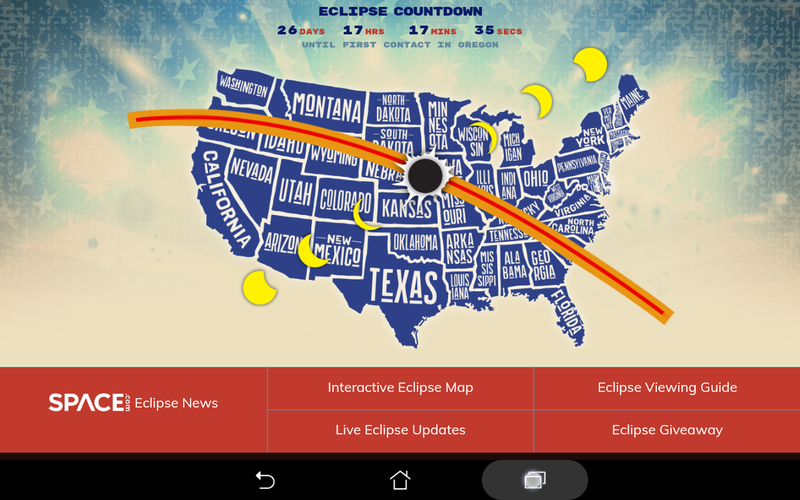 The Eclipse Viewing Guide is a lengthy article with visuals, some history, some good science content, and safety information. The live update page includes links to NASA, SPACE.COM, etc. There's also a giveaway prize form. Very basic. Easy to use.